~Know where and how your food is grown, benefit from our experience and sustainable methods. ~Enjoy great tasting vegetables at a substantial savings off retail prices. ~Support healthy food for everyone. Our surplus is underwritten and donated to local food shelves. 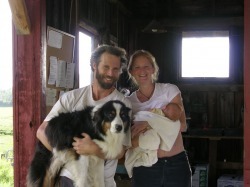 ~Renew your understanding of the connection between community, food, and farming. ~Show your children where food really comes from. Stony Loam Farm is located at 2755 Hinesburg Rd in Charlotte, between Spear Street and Dorset Street.